For a major mobile payment platform on the verge of launch, not much is known about the nuts and bolts behind Apple Pay. A new patent application discovered on Thursday, however, offers a detailed look at how NFC, secure enclaves and software come together to make safe transactions a reality. The U.S. Patent and Trademark Office on Thursday published Apple's application for "Methods for Adjusting Near Field Communications Circuitry during Mobile Payment Transactions." The document provides both a broad overview of what appears to be Apple Pay —as described by Apple at announcement and subsequent marketing materials —as well as a more detailed look at exemplary NFC hardware architecture and operation. 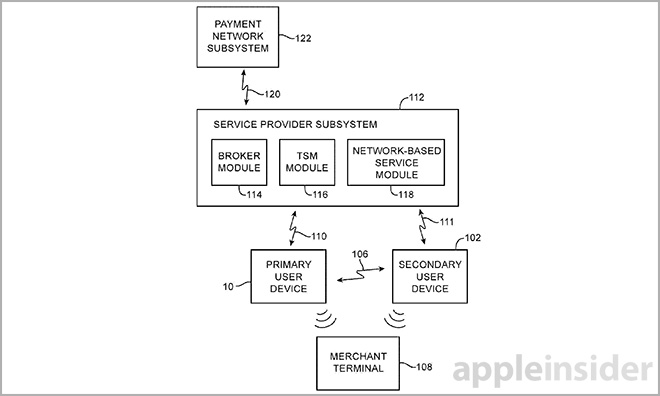 Apple first goes over the basics of its touchless payment system. Leveraging a near field communication (NFC) module, like the component incorporated into Apple's latest iPhone 6 and iPhone 6 Plus handsets, a user device is capable of detecting the electromagnetic field of a point-of-sale terminal. After securely authenticating both device and POS terminal, the system securely transfers over user credentials and tokenized payment data using various encryption methods. The merchant payment processor can connect to a payment network subsystem to verify said credentials and log transaction. A section of the patent deals with payment networks and card issuing banks, which for Apple Pay includes a growing list of partners like Visa, MasterCard, American Express, Bank of America, Chase, Wells Fargo and more. For the user device, each subsystem is treated similarly and can be combined through appropriate services like Apple's Passbook app. As for payment credentials, such as credit card or stored-value card information, the system meshes software and hardware encryption for secure input and storage. In some cases, a user connects to a service provider subsystem to provision new cards onto their device. A broker module on the user device side takes care of authentication with payment network subsystems and manages credentials, while a trusted service manager (TSM) handles secure interaction with POS terminals. Using this technique, the system is able to remotely authorize secondary user devices to download card provisions. Apple already announced the forthcoming Apple Watch will be Apple Pay-compatible and the patent confirms support for a secure enclave on accessories, mentioning a wristwatch as an example. These secondary devices do not necessarily require the same cellular connectivity as the originally provisioned device, but can instead perform a subset of payment functions as long as a secure enclave is present. Apple Pay employs similar protections in storing sensitive user data, with a dedicated Secure Element chip holding credit card information necessary for completing payments. Instead of sending over card numbers and a card holder's name, the secure enclave generates unique digital tokens that are decoded by compatible POS systems using a shared secret method. Tokenizing payment data makes it useless to would-be thieves who manage to intercept the information during the transmission process. In the patent, these functions are covered by the TSM module. Today's filing is specifically concerned with NFC protocols and the hardware and software safeguards required to perform secure transactions without physical connections. The document starts with link establishment which, as mentioned above, is a procedure that begins with a user device detecting a nearby POS. In response to detecting the merchant terminal, a user device takes its NFC receiver out of idle mode and awaits incoming polling commands. If these commands are authenticated, the device establishes a compliant link to carry out data transfer operations and shares link attribute information between both systems. To thwart multiple unsuccessful payment attempts, the invention builds in hardware response settings capable of reconfiguring NFC modules on either end of the transaction for optimal transmission. For example, if the payment device falls out of range or packet data is lost, a processing loop is started to reconnect while the POS terminal saves user credentials in case a connection is reestablished within a predetermined amount of time. Alternatively, power output and other hardware settings can be adjusted dynamically to ensure a continuous link. If a no-response scenario is encountered, the device reverts back to a default idle loop to restart the process. Illustrative settings used to control the NFC circuitry in the user device. The patent also describes in great detail exemplary NFC operating modes, power setting, adjustments, timing windows and other usage protocols that ensure a safe, user-friendly experience. 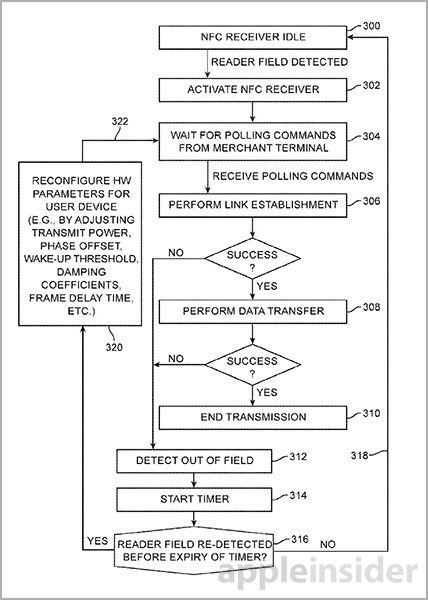 Apple's patent application for Apple Pay NFC procedures was first filed for in May 2014 and credits Vusthla Sunil Reddy, Mohit Narang and Peter Agboh as its inventors.